Hello, and welcome to The Belfry Hotel. My name is Shane Grindle and I am the general manager here. I hope you enjoy our website, and find all the information you require. Me and my staff assure you a warm welcome in our friendly, clean and comfortable environment. We look forward to seeing you, Regards, Shane. The Forest Of Dean is one of the few surviving Royal hunting forests which still boasts a herd of wild fallow deer. There are many places of interest within the forest which attract many visitors throughout the year. The Belfry is nestled on the edge of the forest and originates from early mining days. It was then known as The George and was used by local people after a hard nights work down the mines, in fact the pub was frequently full at 4.00am in the morning! The George, like mining in the Forest fell on hard times and was closed by its brewery owner. It was purchased in 1991 by the Bell family who with the help of local people have created The Belfry. 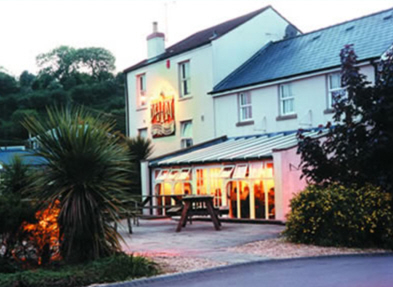 The Belfry offers en-suite accommodation, good food served in the main bar or our tastefully furnished restaurant. Traditional ales, lagers, ciders and full range of spirits and bottled beer. The Belfry also hosts a children’s play area, pool table, dart board, new skittle alley, background music system and satellite television. Treat yourself with this mid week deal !!! Why not try our authentic curry night !! Accommodation at The Belfry Hotel. Forthcoming events at the Belfry. The staff are always good and pub meals and breakfast have been very good. For the price I think it offers great value for money.